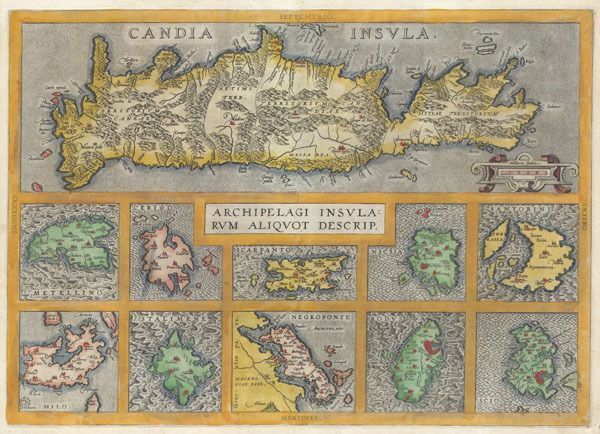 A rare and beautiful 1584 Abraham Ortelius map of Crete and ten other Greek islands: Metellino (Mitiline, Lesbos), Cerigo, Scarpanto (Karpathos), Nicsia (Naxos), Santorini, Milo, Stalimene (Limnos), Negroponte (Euboea), Rodus (Rhodes, home of the Colossus of Rhodes), and Scio (Chios). Beautiful, rich, hand color. Fine or perfect condition. Wide clean margins. Original platemark. Latin text on verso.